Brother detectives Frank and Joe come face to face with…a sasquatch…in the fourteenth book in the thrilling Hardy Boys Adventures series. The legend of the Bayport Beast has haunted the town for almost a century. Each summer brings rumors of a gigantic sasquatch creature roaming the nearby woods. However, this summer brings more sightings than usual, causing all kinds of people to flock to town, including a few UFO enthusiasts who are convinced the beast could be some kind of stranded alien. More than that, the sightings cause a media blitz! Frank and Joe have never believed in the Bayport Beast, but when Frank catches a glimpse of a furry creature running through the woods, he changes his mind fast. And when reports surface of the beast attacking people—including a few friends—the Hardy brothers are on the case! 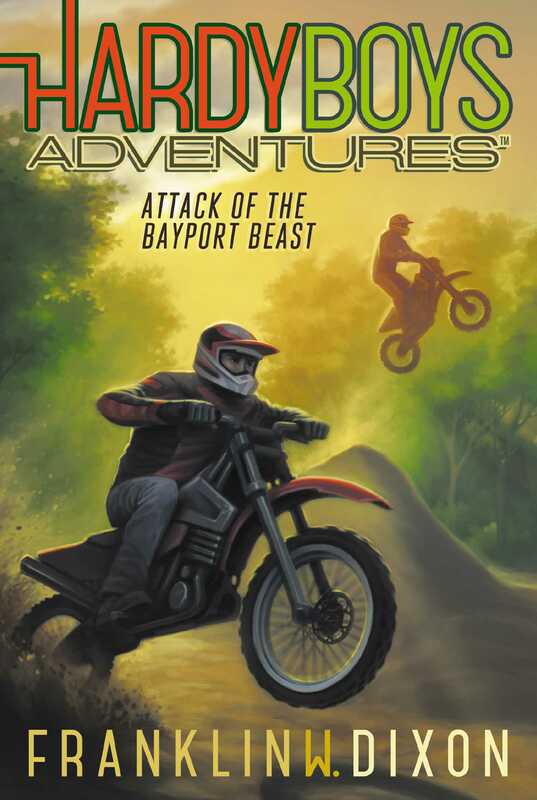 After Frank and Joe are cornered by not one but three fearsome creatures, they have to wonder: is the Bayport Beast real after all? And is it multiplying? AS JOE AND I MOVED through the crowd, I spotted Spiderman chatting with Superman. Off to the right, a Jedi Knight ate a hot dog next to Captain America. We stopped short as Darth Vader marched across our path, his long black cape flowing behind him. Just then, a beastly arm entered my field of view. Dark hair dangled in clumps from the appendage. Bony fingers stretched wide as they reached for the back of Joe’s neck. Each fingertip ended in a sharp, jagged talon. Instinctively, I opened my mouth to warn my brother, but then I caught myself. Hey, it had been his idea to drag me here, so . . . The claws clamped onto my brother’s neck. He jumped and spun around, eyes wide. “Another victim of the beast!” said Hector Cruz—friend, practical joker, and owner of the beastly arm. “Of course there’s a cosplay booth here,” I muttered. Cosplay, or costume play, refers to the practice of people dressing up as their favorite comic book, TV, or movie characters. Not only were cosplay hobbyists everywhere, but all morning I’d taken photos of Joe and Hector standing with Wolverine, Batman, and Robocop, to name a few. “Way cool,” Joe said as he doubled back toward the booth filled with fanciful costumes. “Maybe they have one of those new Stormtrooper helmets.” Hector nudged me on the shoulder. “That would be sick, huh?” He hurried to catch up to Joe. The entire morning had been my brother’s big idea. You can bet I didn’t want spend the first day of summer vacation at a sci-fi and cryptozoology convention. The science fiction part I could get behind. The cryptozoology part . . . not so much. Cryptozoology. A made-up word describing the made-up science of studying made-up animals. At least, that’s how I thought of it. But from the number of attendees and vendors at the convention, a lot of people seemed to take it very seriously. Many of the vendors had booths filled with retro action figures and comic books, but there were just as many selling Nessie statuettes. Nessie—better known as the Loch Ness Monster—is the mythical plesiosaur that, according to believers, somehow survived the mass extinction of dinosaurs sixty-five million years ago and is alive and well, swimming in a murky Scottish lake. I even saw a booth offering little chupacabra plush dolls. Why would any kid want to snuggle up to a Puerto Rican monster that’s famous for living off goat blood? Most of the crypto-vendors sold merchandise related to the main star of cryptozoology—Bigfoot. Posters, figurines, and dolls of the mythical apelike creature were everywhere. One vendor even had an eight-foot-tall, hairy replica that you could pose for photos with. Bigfoot was the reason why this particular convention was held in Bayport at the beginning of every summer. Some people think that Bayport has its own version of the creature roaming the national forest outside of town. These believers even came up with a unique name for it: the Bayport Beast. I caught up to Hector and my brother at the cosplay booth. Hector had indeed found one of the new Stormtrooper helmets among the many costumes from various science fiction and fantasy movies. He slipped it over his bushy brown hair. “Aw, yeah,” came his muffled voice from inside the helmet. “Here, try this,” said the owner of the booth, a woman decked out in full Klingon regalia. She looked exactly like one of the aliens from Star Trek, from the special-effects makeup and forehead ridges to the wicked dagger hanging from her belt. The woman reached a gloved hand over the counter and flipped a switch on the side of the helmet. “I thought we were trying to find Benny,” I said. Hector cocked his head at us. “This isn’t the booth we’re looking for,” his electronic voice murmured, impersonating someone under the influence of a Jedi mind trick. Joe laughed. I shook my head. “Okay, are you shopping or just playing?” the Klingon woman asked, hands on hips. I followed Joe and Hector as they made their way down the long aisle of vendors. I felt like I was babysitting two toddlers who were distracted by every toy they came across. Hector was right about one thing: we were detectives. My brother and I have been solving mysteries since we were kids. And not just kid stuff like finding missing pets; we’ve caught some major crooks in our time. Joe threw an arm over my shoulder. “Listen, bro. You know I’m a logical person.” I raised an eyebrow. “Here we go,” said Joe. “So, life on other planets?” Hector asked. “Statistically? Highly probable,” I replied with confidence. We turned down the next aisle and found our friend Benny Williams standing behind a booth for Bayport’s own Triple B Comic Shop. “Hey! You guys made it,” Benny said as we approached. He was about a foot shorter than us and almost seemed lost behind the racks of comic books on either side of him. Benny was a huge fan of the Bayport Beast. He always had news of the latest sighting or the most recent theory, and he could prattle on forever about the Native American legends describing a giant fur-covered man who roamed the forest. According to local lore, early American colonists spotted the strange creature in the woods, and the town’s founders named the beast. As long as we’d known Benny, the beast had been his main hobby, bordering on obsession. So much so that he even had his own nickname. While Benny rattled through his stock, I noticed another attendee taking interest—a tall, thin man in a blue blazer. He had a bandage on his forehead and a crazy spiked hairstyle that looked as if it had taken a half a tube of hair gel to create. I tried to decide if he was dressed as an obscure sci-fi character. One of the old Doctor Who doctors, maybe? “Well, that might be about to change,” Benny said. Benny reached into his pocket and pulled out a folded piece of paper. He spread it open, and I realized it was an old trail map for the local national forest. There were several dark Xs drawn on different parts of the trails. “I’m thinking about giving tours on all the latest squatch sightings,” Benny explained. Benny liked calling the creature a “squatch,” short for Sasquatch, the name Native Americans gave Bigfoot back in the day. “Count me in,” said Hector. He exchanged a fist bump with Benny. Joe grinned and looked at me.